You can’t buy happiness, but you can buy beer and that’s pretty much the same thing… right? Well, what would you do if instead of going to the store to buy beer, you could instantly make beer at home, or anywhere, with just two easy steps. Sounds impossible! Kingfisher believes that a drink like beer deserves to be had anytime, anywhere! 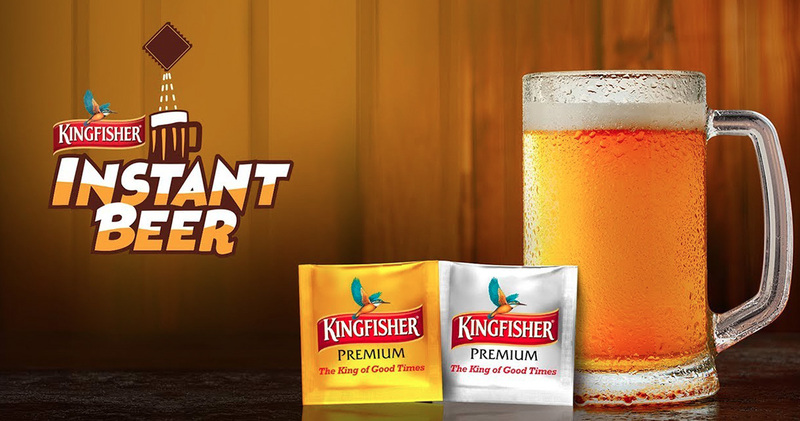 On March 30th, 2019, United Breweries, India’s biggest beer producer that also makes the famous Kingfisher brand, announced their latest product — Kingfisher Instant Beer. The product is sold in a box which contains two sachets. One is the carbonation powder to give your instant beer the refreshing fizz. The second is the ‘beer powder’, which gives the instant beer the actual Kingfisher beer flavour you know and love. How does instant beer work? The world’s first instant beer is made by first mixing the carbonation powder into cold water. This creates, you guessed it, carbonated water. After your fizzy H2O is all mixed up, it’s time to add the beer powder. The beer powder is made by a freeze-drying process which separates the water from the dry matter of beer. So, by putting the two back together, you theoretically get the same beer back. It only takes two, simple steps to produce a refreshing pitcher of beer, with the “same great taste” as regular Kingfisher beers! While the convenience of having a beer instantly could be it’s selling point alone, the brewers from United Breweries believe that the main advantage of instant beer is the incredibly easy transport and storage of the product. Where can I purchase Premium Instant Beer Sachets by Kingfisher? This is an April Fools’ joke, right? Yes! Kingfisher has shown that they’re more than just master brewers, but they are also master pranksters! After the announcement of Kingfisher Instant Beer, the campaign received over half a million views and over 70 000 shares in as little as 48 hours. On the morning of April 2, 2019, United Breweries broadcasted on YouTube that the instant beer idea was in fact, an April Fools’ prank. Did you believe the Kingfisher Instant Beer April Fools’ Day Joke? Would you buy “instant beer” if it was real? We’d love to hear your thoughts on why, or why not, instant beer could be the greatest beer invention of all time!